Each month BGI sponsors a special two or three-hour event that encourages residents to experience the beauty of our area, learn and help nature. Some are workdays which are family friendly events and excellent company volunteers events. Some are expert guided hikes in one of our nature preserves to discover native plants and animals. All are hands-on, be out in nature, meet new people, fun events. Events are listed on the home page calendar and for more information call CFC at 847-382-7283. Join us. CFC’s work for nearly five decades has produced healthier ecosystems throughout the greater Barrington area. Building on this success, CFC has launched the Barrington Greenway Initiative (BGI). BGI will create unbroken, linked habitat corridors, increased biodiversity, and strengthened ecosystems to deliver benefits to our community. This is an ambitious objective for the next several decades, and CFC has partnered with other area conservation organizations and foundations to ensure its success. Nature crosses the jurisdictional boundaries created by villages, townships and counties. BGI has brought together six strategic partners to collaborative share priorities, plans and resources to deliver greater benefits to nature. Working together is producing larger, higher quality and strategic restorations. The groups are working together to create a linked greenway from the Poplar Creek area north to Port Barrington, an area encompassing more than 14,000 acres of prairies, wetlands, and woodlands. Key species of plants and animals have been selected for reintroduction into the greenway areas as the ecosystems mature, and the linked land will support other birds, insects, amphibians and native plants. The improved ecosystems will provide cleaner air and water, help control erosion and flooding, and create areas where residents can connect with nature. The Barrington Greenway Initiative is as important and forward-looking as the original 1970 plans to protect green spaces in the Barrington area. BGI builds on that original strategy and will expand nature’s benefits for generations to come. 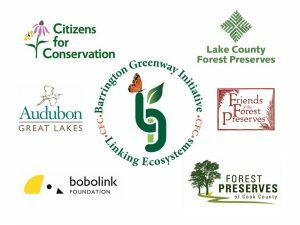 BGI strategic partners are: Citizens for Conservation, Lake County Forest Preserves, Forest Preserves of Cook County, Audubon Great Lakes, Friends of the Forest Preserves and Bobolink Foundation.